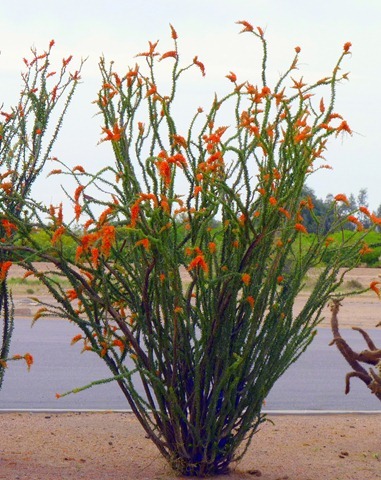 April is a month of change for us as each year we leave our winter home in Yuma AZ and head eastward. 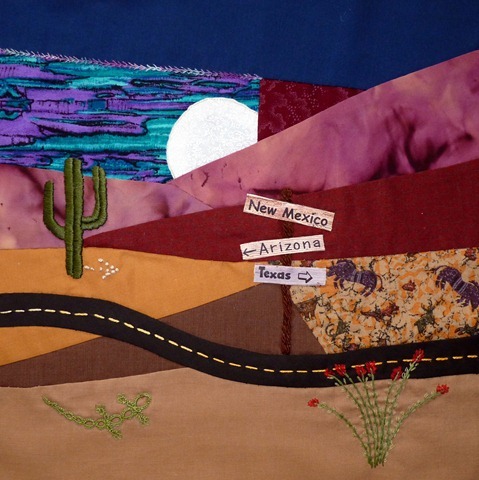 As I thought about what to do with my CQJP April Crazy Quilt Block, I decided to create “Twilight in the Desert” for just as the day comes to an end in the desert, so does our time in the desert end each April. I’ve used Satin Stitch before, and always had trouble keeping the stitches even and getting good coverage. My sampler fabric helped with it’s evenweave. I created a saguaro in the desert sunlight. 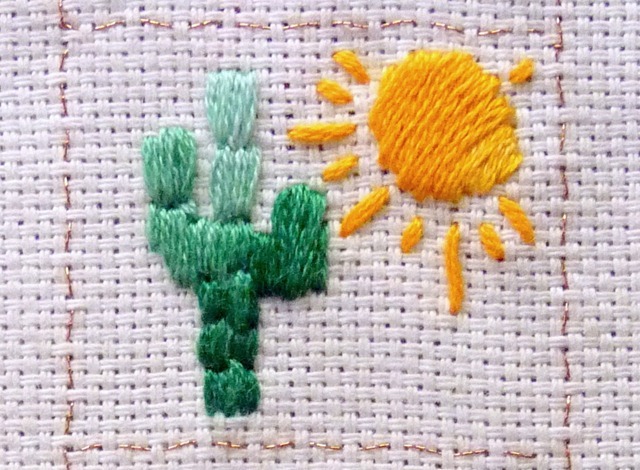 For my CQJP Block, I created another saguaro with the satin stitch. 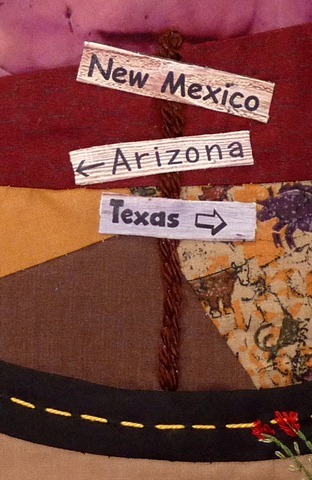 This time, I first cut a saguaro shape from dark green fabric, and attached it to the block with Wonder Under. I then drew a line down the center as a stitching guideline. 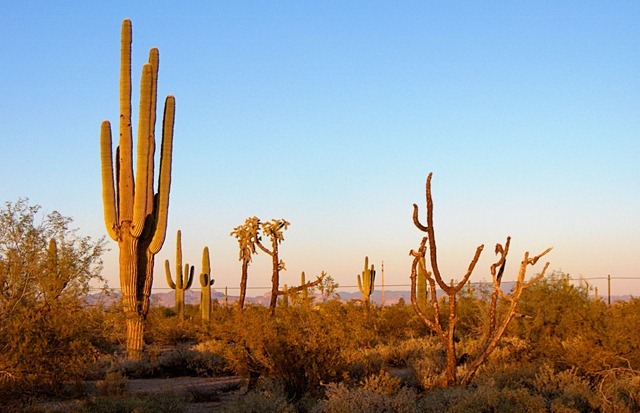 The completed saguaro looks like this. The green fabric underneath really helped to hide any minor “cracks” in the stitching. I’ve grown to like the satin stitch a lot more as I worked with it this week. Although the stitched saguaro is depicted at twilight, we have photographed the saguaro at sunset, which is a beautiful time of day! Stem Stitch has probably been my most used embroidery stitch over the years, although I usually thought of it as outline stitch. Sharon, of Pintangle and coordinator of TAST, says there is a difference between stem and outline, although I have a hard time seeing it. I think I probably switch back and forth between the two, depending on the curve I’m creating. 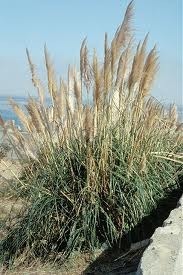 I used it to create Pampas Grass, an ornamental grass, on my sampler. 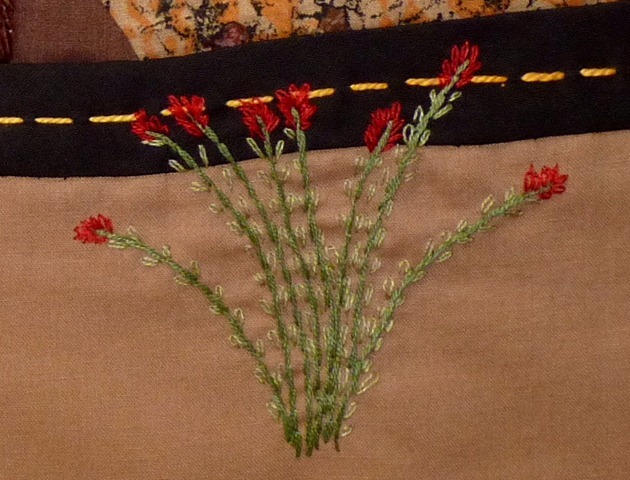 For the Crazy Quilt Block, I created an Ocotillo in bloom, using the stem stitch and the detached chain stitch covered a few weeks ago. 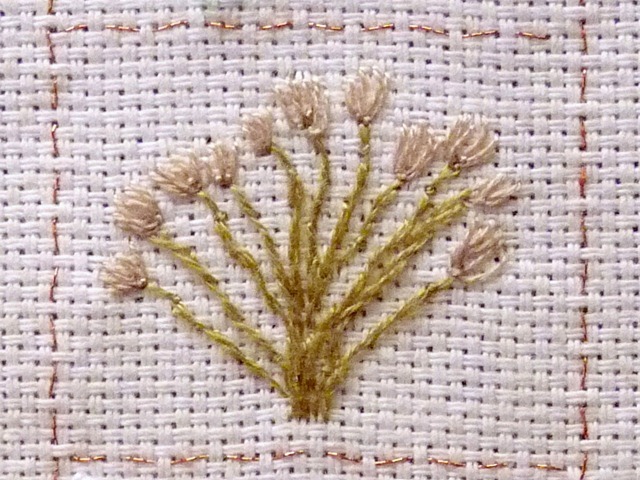 French Knots have always been hard for me, so I decided to make several on the sampler. 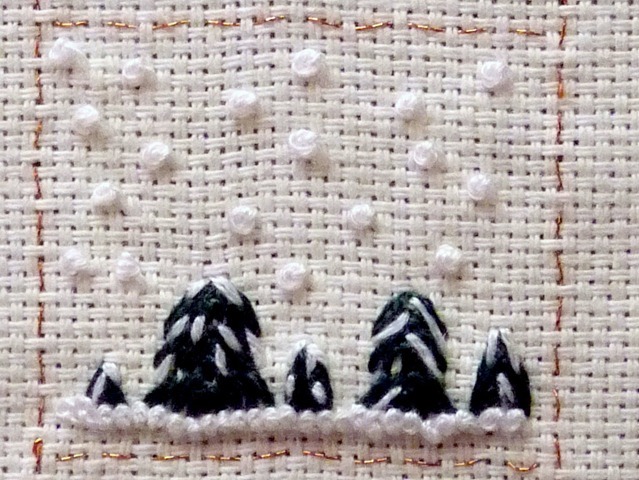 By the time I finished my depiction of Snow in the Pines, my french knots were becoming a little more uniform, although they will never be a favorite stitch of mine. I did like the way the bottom row of knots turned out. I love the snow, especially when a new wet snow of huge flakes is falling. I love to walk in a falling snow… once, when I had a big decision to make I took a long walk by myself. The snow was drifting down, snowflakes as large as silver half dollars. I remember removing my gloves and can still feel the wet flakes as they fell on my palm. It was during that walk that I decided to marry my husband. 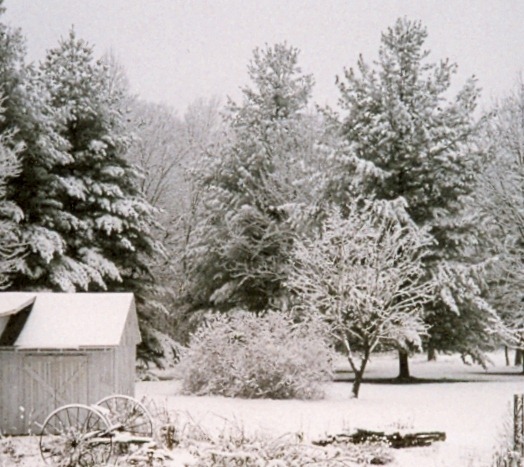 We celebrated 33 wonderful years together this week… perhaps that’s one reason I like a snowfall so much! From Snowflakes to Stones…. My Twilight in the Desert called for something far removed from snowflakes. 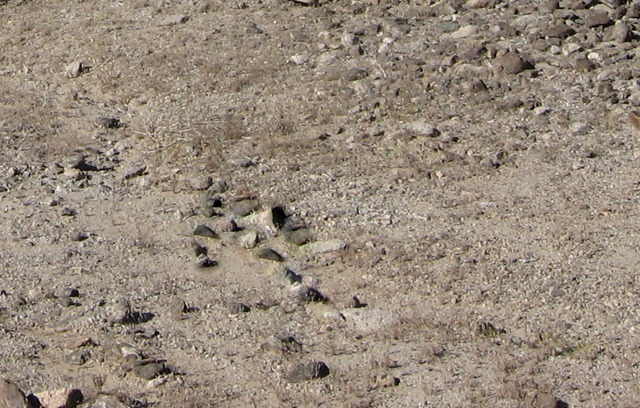 When you follow a blazed trail through the desert, often the only way to mark the trail is with rocks. They can be piled as cairns, or laid on the sand in the shape of an arrow pointing the way. 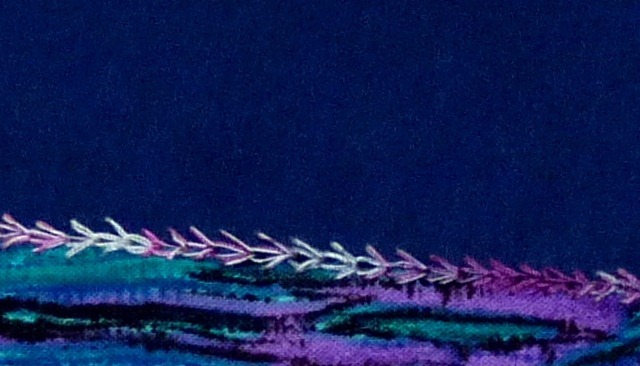 I’d never seen the wheatear stitch before, but I love it. It’s such a pretty stitch, and I can imagine lots of future applications for it. 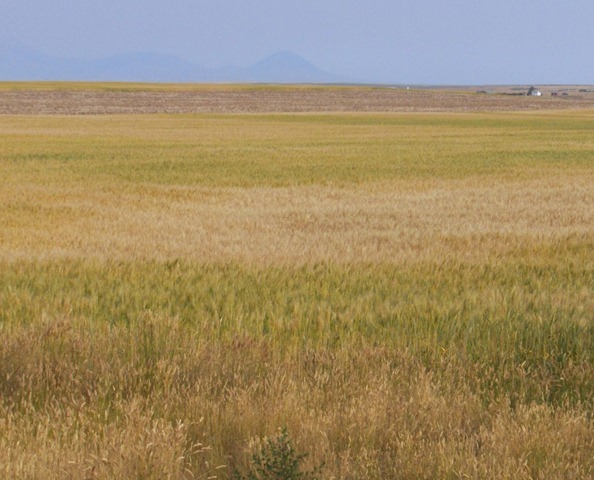 With a name like wheatear, it had to become Amber Waves of Grain on the sampler. 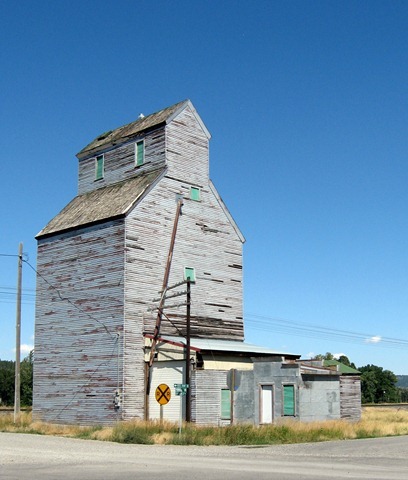 In the background, you can see the grain elevator. 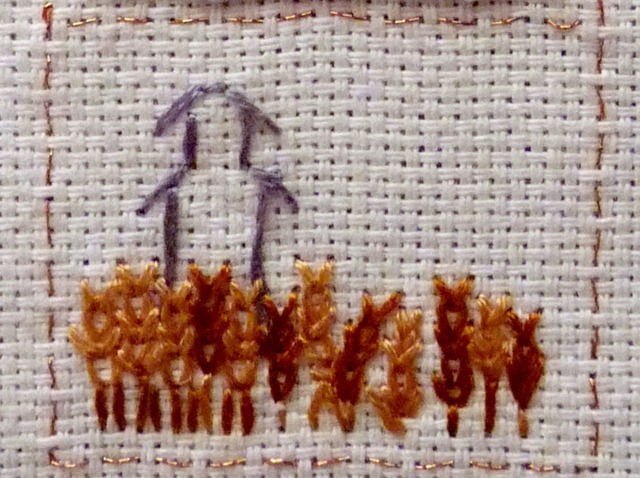 For the CQJP block, I used the wheatear stitch to create a transition between sections of the sky. I’ve decided to symbolize our travels throughout the summer with a highway running through my blocks. 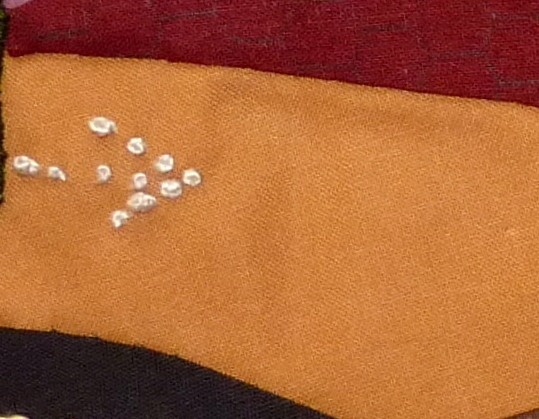 To accomplish this, I used a bias cut black strip, with a running stitch down the middle. We left Arizona to travel through New Mexico and then into Texas, where we are currently for a month. I used printable fabric to make the boards for a road sign. 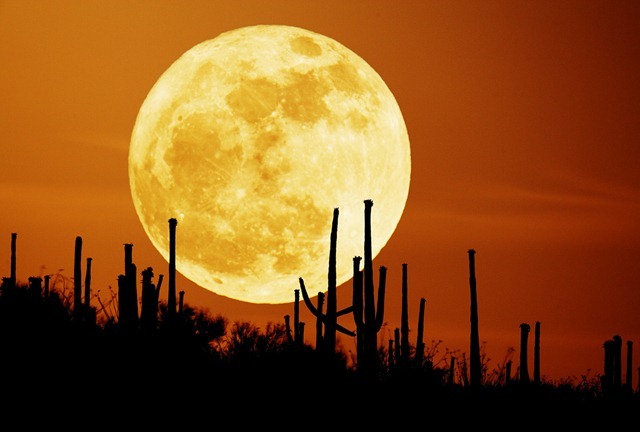 To complete the scene, the Harvest moon appears large on the horizon. We’ve never gotten a photo of the occurrence, but we have observed the moon over the desert when it looked as large as it does in this photo from the NASA website. As twilight deepens, the animals that found shady refuges during the day begin to come out. A small newt (Netty the Newt – pattern by Anne Bruvold) is spotted near the road, and in the distance there appears to be movement. Is it really a group of animals, or perhaps mythical creatures created from the dying heat mirages of the day? Twilight in the Desert can truly be magical! 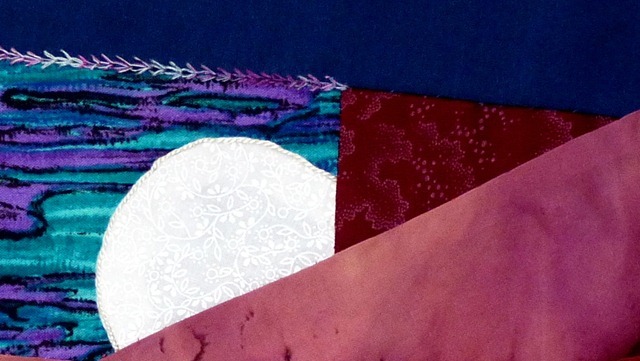 This entry was posted in CQJP, Embroidery, Quilting, TAST. Bookmark the permalink. Thanks, Fiona! I appreciate the compliments. My blocks always take longer than I anticipate as they evolve, but I have fun with them. What a good idea to use photographs as a source of inspiration. I have learnt so much from fellow TAST members. Thanks for the idea. I love how you show your inspirations!!! This is a beautiful composite of lovliness!!! What a beautiful project! I like your pictures and admire you that you are able to incorporate the TAST-stitches! Thanks, Miriam! I had just decided to take the TAST challenge when I saw the CQJP challenge, and thought it would be fun to combine the two.